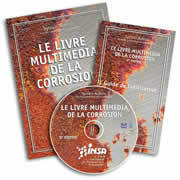 The Multimedia Corrosion guide is the reference work for scientists, engineers, technicians and students in the field of corrosion, anticorrosion and durability of metallic materials. When knowledge is combined with experience, the result is a work of unprecedented quality and detail. 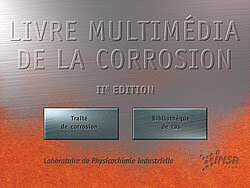 The greatest corrosion specialists in industrial environments (Aerospace, CEA, EDF, ELF, Fragéma, GDF, Pechiney, Renault, Rhône-Poulenc, Ugine, Arc'Antique, Ifremer, LEMMA ...) collaborated with academic experts (INSA , UTC, ENSEEG, ENSCP, ENSAM ...), led by Professor S. Audisio, Laboratory MATEIS-CorriIs from INSA Lyon, to achieve this multimedia guide. In addition to the Corrosion Treatise, this program also contains a Case Studies Library, a corrosion database to which users can add their own experience base. New cases are automatically inserted alongside the existing ones, with the same selection criteria. Numerous other advanced functions make this Cdrom a unique, intelligent, professional and invaluable reference tool.